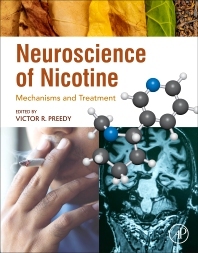 Neuroscience of Nicotine: Mechanisms and Treatment presents the fundamental information necessary for a thorough understanding of the neurobiological underpinnings of nicotine addiction and its effects on the brain. Offering thorough coverage of all aspects of nicotine research, treatment, policy and prevention, and containing contributions from internationally recognized experts, the book provides students, early-career researchers, and investigators at all levels with a fundamental introduction to all aspects of nicotine misuse. With an estimated one billion individuals worldwide classified as tobacco users—and tobacco use often being synonymous with nicotine addiction—nicotine is one of the world’s most common addictive substances, and a frequent comorbidity of misuse of other common addictive substances. Nicotine alters a variety of neurological processes, from molecular biology, to cognition, and quitting is exceedingly difficult because of the number of withdrawal symptoms that accompany the process.